If you perform a search for index.dat files on a computer that is running Windows you will most likely end up with dozens of files with that name. The index.dat file is used by Microsoft Internet Explorer as a database that contains cookies, urls and recently opened files. This information remains stored in the index.dat file even if the user is clearing cookies and the history in Internet Explorer. An index.dat viewer is a tool that can display the information stored in those database files. 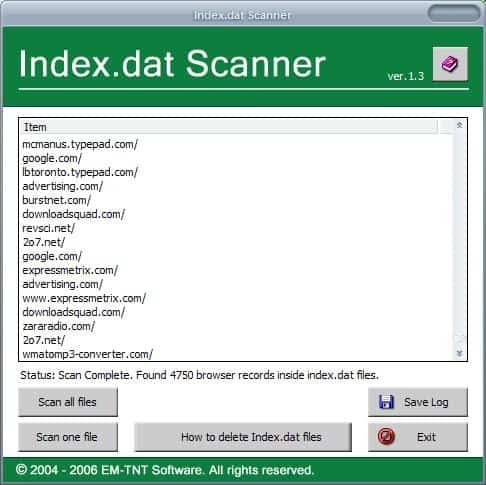 Index.dat Scanner is such a viewer that can scan all index.dat files on the computer that it can located or a specific one that the user selects from the system. The scan takes some time but results are displayed as they are found. The software program will list all of its findings in a list that can be exported as a text document. It did find more than 4000 entries on the test computer although Internet Explorer itself was rarely used on it. The information listed in the index.dat databases list recently opened files, urls that the user visited in the past and cookies that have been stored during browsing sessions. The index.dat files are by default hidden locked system files that cannot be deleted in Windows directly. Several tools like CCleaner exist that can clear the contents of index.dat files on a Windows system directly which is probably the easiest way to clean those files. Index.dat Scanner can be used to check if all traces have been deleted in the files. It is obviously important to run the cleanup regularly because the files get populate whenever a file gets opened or Internet Explorer opens a website. Personally I’ve situated Internet Explorer cache and cookies folders on a RAM disk which means index.dat files are new at every boot. Not bothering for the cookies since Firefox is my default browser and that is where I keep only very few cookies. Windows, which I started at version 3.1, has never abandoned this index.dat ‘philosophy” and I do wonder why when I see the impossibility to delete them on a session. Look at Firefox, no problem with their sqlite formats ! Microsoft wants to be loved (again), I think their practices should meet their hopes.